If you’ve ever owned indoor plants, chances are you’ve probably experienced confusion around why your plants keep wilting, especially when you’ve been doing everything ‘right’ (or so you think!). You’ve been watering them regularly, positioning them near sunlight and sending them happy ‘you-can-do-it’ vibes. You may have even typed into google, ‘Brisbane Plant Doctor’. Unfortunately, there’s lot more involved with caring for your office plants than you may think! 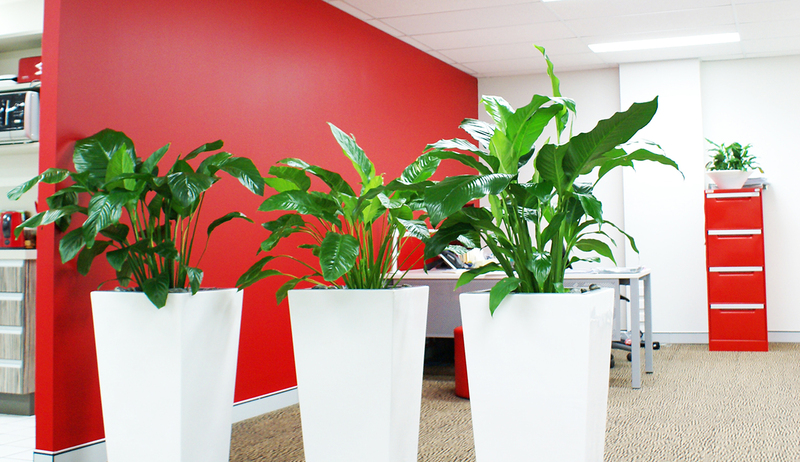 When caring for your office plants, there are two approaches you can take – hire a professional team of Brisbane plant specialists to conduct regular maintenance or you can DIY your plant installation and care. Having a team of people maintaining your office plants is preferable as it means office staff – with zero green thumbs – can focus being their productive selves instead of worrying about the lifespan of the office plants. It also means that your office plants are going to look amazing year-round and will caontinue to have a calming effect on colleagues and impress clients when they visit. 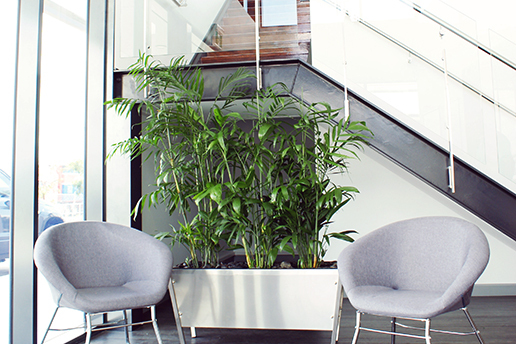 We know you’ve invested in office plants for a reason. If you want your plants to continue to serve their aesthetic purpose of beautifying your office space and the practical purpose of improving the quality of the office air, it’s a good idea to equip yourself with the knowledge of how to care for your plants correctly. If you decide to maintain your office plants yourself, we’ve put together a handy ‘How-To’ guide to simplify the process of caring for your office plants with hopefully fewer causalities. Overwatering is a major concern for indoor plant owners and is just as much of a threat as underwatering. 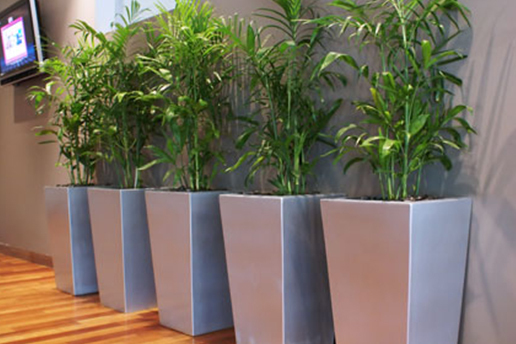 Approximately 80 percent of the issues encountered by indoor office plants are caused by overwatering and improper lighting. When considering how much water your office plants need it’s important to remember that different types of plants require different water levels. Many people like to know how many times they should be watering their plants a week but unfortunately the needs of each species and each individual plant are different. The frequency of watering also depends on environmental factors, such as the proximity of the plants to a natural light source. It’s best to monitor your plants and water them when the they need it. You can do this by simply pushing your finger into the soil. If the soil feels dry, water is required. If it is moist, the plant doesn’t need watering. A water meter or soil probe may also very helpful. A water meter indicates how wet or dry the soil is by giving a numerical value. A soil probe is used to extract small amounts of soil at different soil depths. These samples can then be analysed to determine their moisture content. The best way to water your plants (if you can lift them, that is!) is over a sink. Simply let the water run through the plant and into the sink. For larger plants, you can water the plant over a tray but be sure to discard any excess water that pools in the tray. Indoor plants are ones that adapt well to living in low light. Majority of indoor plants are na-tive to forests and are used to having a canopy above them. They generally don’t require a lot of sunlight, they grow slowly and make excellent office plants as office windows tend to provide very low light. 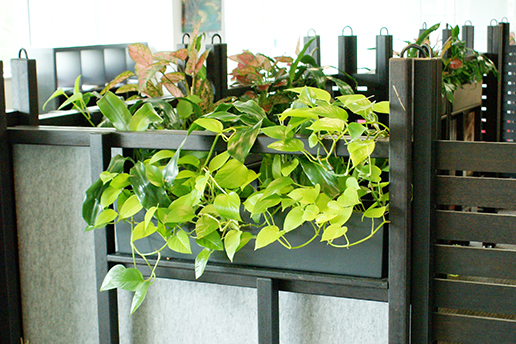 Many office plants prefer a home with some morning sun until midday, and late-afternoon shade. In the office, a routine of retracting the blinds during particularly sunny periods of the day may help. Some signs that your plants are getting too much light are that the flower colour looks faded, the leaf edges appear dried or burnt or the entire plant begins to droop. On the flipside, if your plants are soaking up too many rays of sunshine, you may notice that the growth slows, there are fewer buds and flowers or the entire plant leans towards the source of light. When caring for your office plants, it’s important to consider the impact of environmental factors such as heaters, aircon and dust. If you notice that your indoor plants leaves are los-ing colour or dropping, it may be the result of low air temperatures. To offset this, office plants should be positioned away from the direct firing line of air-conditioning units and vents that blast warm or cool air. Most indoor plants rely on humidity to survive. If the air is too dry, they are unable to absorb enough water through their roots to keep up with the water that is lost through their leaves. Air conditioners reduce the humidity and heat that many indoor plants require. Misting their leaves each day, clustering your plants for communal humidity and setting the pots on trays of moistened gravel may help. The accumulation of ‘dust’ on indoor plants is another chal-lenge with indoor plants. A simple solution is to place them outdoors for a wash when it next rains, where possible. Choosing a nutritious soil mix and an appropriately sized planter is essential for plant longevity. When you’re purchasing your potting soil, it’s important that the mix provides adequate space for air and water to support healthy root development. Indoor potting mixes are often soilless and can consist of peat moss, vermiculite and perlite. These mixes absorb moisture, but they usually dry out quickly. An advantage of a soilless mix is that it is sterile, so there’s a reduced risk of introducing pests or plant diseases. The downfall is that fertiliser is a necessity. If a plant appears too big for the planter and the leaves are dry and not shiny, you may need to replant it using a larger planter. Tease out the roots and add additional potting mix to rejuvenate from the roots up. Just because your plants live indoors, doesn’t make them immune to pests. The most common pests that affect indoor plants are scale and mealy bug. Particularly if your plants are under stress, they can be prone to Scale, which appears as tiny brown lumps on the foliage of your plants. So, how can you help? According to abc.net.au, if there are only a few lumps, they may be scratched off. However, if the plant is thoroughly affected, you can use horticultural oil. Be sure to monitor your plants as one diseased plant can infect other good plants if they are not attended to. Most importantly, if you want your office plants to thrive, you need a care plan for your office plants. Having a care plan positioned in a common area is a great visual way to keep track of who is responsible for caring for the office plants. Recording the frequency of watering will also help you to avoid under or over watering. Featuring indoor plants in your office environment can be a rewarding, calming and enjoyable experience for staff, clients and visitors. If you follow the above steps to DIY your office plant care, looking after your indoor plants doesn’t have to be stressful. If you’d prefer to leave the ongoing maintenance of your office plants to the Brisbane Plant Specialists, you can always learn more about our award-winning customer service and Services here. We can even help with the design and installation of a beautiful Brisbane plantscape that – with our expert green thumbs – will flourish and impress. 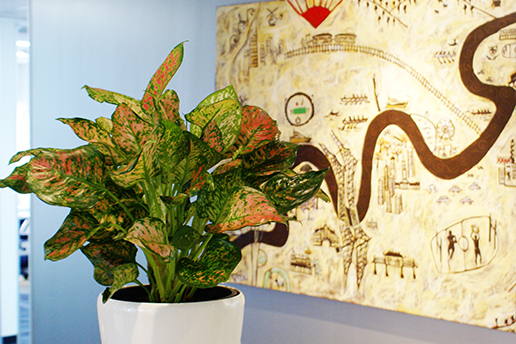 We look forward to the opportunity to help you ‘reap’ the benefits of having office plants in your office year-round.